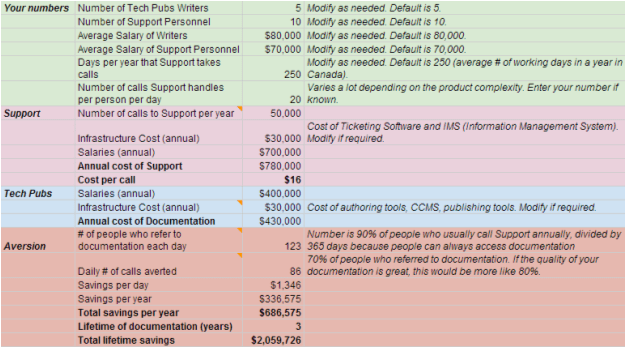 How Great Documentation Saves Money Writing Assistance, Inc. In this age of open information access, when users can’t figure out how to use your product, they will first look for the official documentation, then try unofficial forums (peer help), and lastly, will call Support. Support is what we need when product documentation does not do its job. By the time users call Support, they are a) annoyed with the documentation, b) annoyed with the product, and c) annoyed with the company. What they want and what they need is for the documentation to answer their questions. To state the obvious: The poorer the quality of documentation, the more people need to call Support. The more people needing to call Support, the higher the cost of running your business. Some companies are charging for Support and this is a valid cost model, but you’ll find that customers will not put up with being forced to call Support due to bad documentation. That’s a fast way to an angry mob and bankruptcy. Putting enough effort into the documentation side is an easy, cost-effective way to avert the very costly expense of having someone call Support. Each time users find the answers to their queries in the documentation, the company saves time and money. If you don’t believe me, take a look at this calculator. It doesn’t factor in all costs, but it calculates the savings you can realize when you avert calls to Support using great documentation. Time creating/maintaining the ticketing system to track who asked what question, whether/when they got an answer. Time help desk spends looking through documentation , looking through help desk information systems, then, if needed, asking engineers/developers to answer the question. Time spent determining if the issue is a bug, a gap, or not a problem at all (designed that way or customer misunderstood). Time creating/maintaining an information sharing system, so Support personnel can draw upon an already asked and answered question instead of re-investigating an issue. Ideally, Support should fulfill a different role, a more important role than plugging the gaps in documentation. Just having “good documentation” is not good enough. Users will still be making too many calls to Support. Each time Support has to spend time with a user solving a problem which could have been handled in the documentation, time and money are being wasted. “Good documentation” may seem adequate to most people inside the company because it covers what they would want to know about the product. However, they are not optimal reviewers of the documentation because these people are often not in direct contact with users and their needs. To be “great”, the documentation needs to be kicked up from just “good”. Great documentation takes the content that extra, vital step forward that results in users looking for and actually finding answers to their questions. A lot goes into the infrastructure of great documentation, including mechanisms for finding and customizing content (filtering, multi-faceted search, role-based content, assemble and print on demand, etc.). Those are all very important mechanisms to build into your content strategy, but there’s one thing documentation must have to be great: user focus. Great documentation is written from the perspective of users. It takes into consideration what they already know, what they are trying to do, how they are trying to do it, how they will access the product, access the documentation, and about a hundred other important aspects. At the end of the day, that documentation is meant to help each person get to the end of their business day having been productive and efficient using your product. 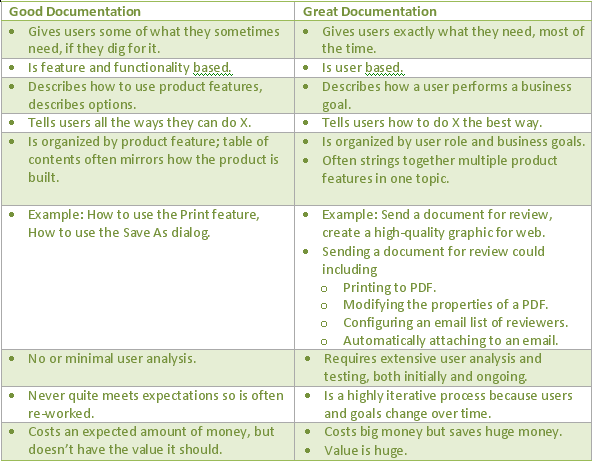 Great versus good documentation is the difference between documenting product features versus documenting user goals. Great documentation is an investment into the product and into the future of the company. It is worth the time and money to get it right and keep getting it right. The savings in call and cost avoidance when it comes to Support can be monumental. As a nice side benefit, your users will be happier.